The Regular Route of Fairview is listed in 50 Classic Climbs of North America—“routes which ambitious climbers dream of doing.” There is no doubt that it is one of the climbs to dream about in Tuolumne Meadows. 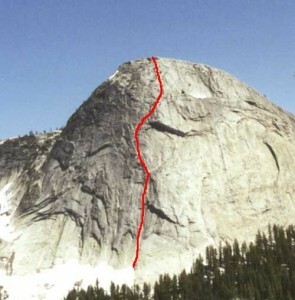 The route follows the longest steep line in Tuolumne and contains pitch after pitch of sustained and rewarding cracks. Views of Daff Dome and the Grand Canyon of the Tuolumne River are outstanding, surpassed only by the 360-degree panorama from the summit. The climbing features good pro, variable cracks and many options. Bring plenty of nuts as the line is loaded with perfectly tapered placements. Be ready to wait in a line and/or start the climb early (cold). There are few opportunities to pass slower parties. Sixty-meter ropes are recommended as they allow you to reach better belay options throughout the route. Few mountaineers have the good fortune to stumble upon a climbing area as undeveloped as Tuolumne Meadows was in 1958. One such lucky person was Wally Reed, who felt like a child turned loose in a toy store as he puzzled over which should be the first big climb of the region. Reed had noticed half a dozen intriguing route possibilities, but his thoughts kept turning to the symmetrical 900-foot-high north face of Fairview Dome. On its steep north face were two long, conspicuous cracks; the right-hand one looked promising, for it shot up 300 feet and ended in broken rock. At the 450-foot level was a huge crescent-shaped ledge, and if it could be reached, the remainder of the route looked easier. Early in the summer of 1958 Reed met 19-year-old Chuck Pratt, who at that time had been climbing for less than a year, and asked him if he would be interested in making an attempt on the north face of Fairview. Pratt agreed immediately, flattered that a man who had labored on El Capitan with Warren Harding would ask him along on a new route. When Pratt arrived in Tuolumne and saw the marvelously direct route Reed had picked out, he knew at once it had the ingredients for a memorable climb. The first pitch of the climb went free and fast. But higher, as the cliff steepened, the two men were forced into direct-aid techniques. Since he had never done such extensive aid work, Pratt regularly tangled his feet in his aid slings, much to the amusement of Reed, who was completely at home on a long piton ladder. Twice it was necessary to belay in slings, an awkward technique Pratt had done only on practice climbs. So attentive were the men to their world of stone that when the sun disappeared behind a nearby ridge, they were caught by surprise. From a small ledge 400 feet above the ground, the pair hurriedly abandoned the face, satisfied that the route was feasible at least as far as what they called Crescent Ledge. It was not until August that the two climbers found time to return. They decided to carry bivouac gear on this attempt, which was a wise decision, for it was dusk when they reached Crescent Ledge, and the temperature quickly plunged to the freezing point. Insulated in their sleeping bags, the pair watched the moon rise over the Sierra crest and illuminate a world glowing with granite. Early the next morning Reed and Pratt began noticing subtle changes in the character of the rock. In the vicinity of Crescent Ledge, flakes and knobs began to appear, and the excited climbers stowed their aid slings and rapidly gained elevation. A four-foot ceiling that cut across the face at the 600-foot level looked formidable, but hidden, juglike holds permitted the obstacle to be free climbed easily. By noon, the two men had reached the rounded summit, amazed by the fact that they had covered the final 500 feet so easily.